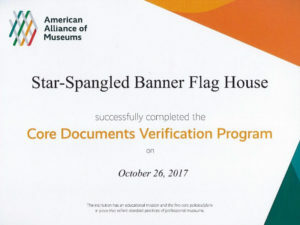 Baltimore, Maryland November 7, 2017 – The Star-Spangled Banner Flag House has passed the American Alliance of Museums’ Core Documents Verification, and important milestone in its ongoing efforts to demonstrate excellence and meet standards and best practices. Earning Core Documents Verification means the national professional organization for the museum industry has verified – through a thorough expert review- that the museum has an educational mission; and ethics, planning, emergency, and collections stewardship policies in place that reflect standard practices of professional museums. These elements were evaluated because they are deemed essential for every institution that identifies itself as a professional member of the museum field. Of the nation’s 35,000 plus museums about 1,100 have passed the Core Documents Verification. The Star-Spangled Banner Flag House is one of 25 museums in Maryland to have done so. One reason we undertook this outside review was to show our public that the museum has in place the policies and plans that are essential to good museum management and which provide our staff and governing authority the structure, ethical grounding, and accountability needed to make informed and consistent decisions for the good our public and in support of our mission and sustainability. 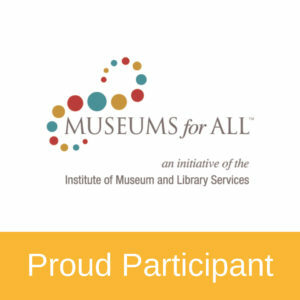 The American Alliance of Museums has been bringing museums together since 1906, helping to develop standards and best practices, gathering and sharing knowledge, and providing advocacy on issues of concern to the entire museum community. With more than 15,000 individual, 3,000 institutional, and 300 corporate members, the Alliance is dedicated to ensuring that museums remain a vital part of the American landscape, connecting people with the greatest achievements of the human experience, past, present, and future. For more information, visit www.aam-us.org.